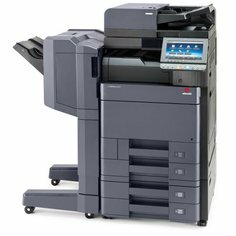 The new A3 monochrome d-Copia 4000MF/5000MF/6000MF multifunctional systems represent a new era of performance and functionality for the current fast-moving business market. Print quality has reached new high levels of excellence with superior print resolution enabling even the lightest grey scales in images to be faithfully reproduced and text and fine lines to be clearly defined. The fast scanning speed, in the most popular formats and with standard duplex scanning available, enables users to save time resulting in increased productivity. As a result of reduced energy consumption and secure data management, these multifunctional systems are ideal for offices with large volumes of work where data security is of great importance. First Print-out Time d-Copia 6000MF: Approx. 3.8 sec. d-Copia 5000MF: Approx. 4.3 sec. d-Copia 4000MF: Approx. 5.1 sec. Prestazioni riferite ad un utilizzo del prodotto in condizioni ottimali. Con riserva di variazione delle specifiche tecniche. d-Copia 4000/5000/6000MF toner Duration up to 35,000 pages (36,500 ISO 19752).